Comfortable apartment for three people surrounded by the Tuscan countryside and situated in the heart of the Val di Chiana, exceptionally excluded from the typical tourist routes, not far from the incredible beauty of the Crete Senesi and the Val d'Orcia (Unesco Heritage). Ideal place for a relaxing holiday and for those who love hiking and cultural tours. 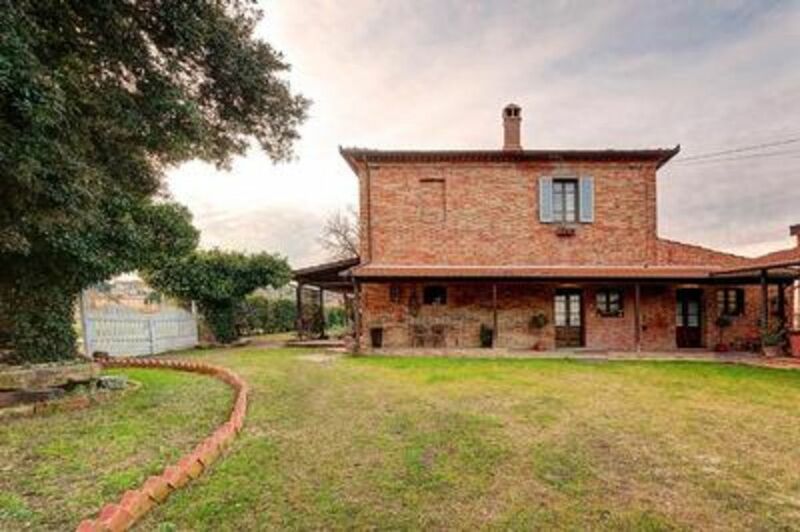 Indeed the property is located just a few kilometers from the most famous art heritage cities of central-Italy, with a particularly high concentration of historical assets and local traditions, as Siena, Arezzo and Perugia. Cortona, Montepulciano, Pienza and the many medieval villages are also the testimony of a grand past that still deeply characterizes the entire area. Part of the Val di Chiana was already largely populated since Etruscan leaving numerous archaeological areas and finds today visible in the local museums. The accommodation, about 50 m², has independent access and consists of a double bedroom, a living room with kitchen and sofa bed for one people and a bathroom with shower. The decor of the interior in rustic style blends with modern design elements, giving the entire housing a particularly welcoming and comfortable look. The spacious and bright bedroom offers guests plenty of space to store clothing and personal stuff. The living room is furnished with a dining table and a sofa and is equipped with a modern fitted kitchen. The entrance is decorated with an elegant patio which leads directly to the garden. The entire property, within a farm, has three other apartments so it is possible that during your stay some areas of the garden are in common with the rest of the guests. The farm makes available a vegetables garden full of genuine products ready to be caught and grilled on the spot. A few kilometers from the apartment there are the thermal baths where you can (by appointment) to receive treatments and massages. During the winter the heating is not included in the price. Heating must be paid on consumption (EUR 4,50 m³) on the spot. Please note that in the apartment is allowed only one small size pet and is not equipped to accommodate disabled people. "Locazione ad uso turistico" (rent for touristic purpose) stipulated under the Italian law n.431, article 1, paragraph 2, letter C, 9 December 1998 and subjected to the "discipline of the leases and the release of the buildings used for residential purposes" as provided by Italian Regional law n. 42, Art. 57, 23 March 2000, contained in the T.U.L.R. regarding tourism. Sinalunga is a hill-town with Etruscan origins where farming is still one of the most important sources of income along with flourishing small industries. Numerous hotels and farms attract tourists from all over the world. During your stay in the splendid countryside around Sinalunga, don't miss a visit to the Teatro (Theatre), built in the 18th Century and named after famous local musician, Ciro Pinsuti. Also worth seeing are the coats of arms of the Podesta' on the walls of the 15th Century Palazzo Pretorio. Sinalunga boasts several churches of great importance including the 17th Century Collegiate Church of San Martino with works by Girolamo del Pacchia, the 18th Century Church of Santa Croce, and Santa Lucia. On the hill at Poggio Baldino just outside the town you will find the Convent of San Bernardino with works by various 16th Century artists. On the road to Torrita di Siena stands the town's oldest church, the Romanesque parish church of San Pietro ad Mensulas, with three naves. It contains two interesting burial urns dating back to Roman times. Once a centre of agriculture and furniture-making, today there are many small factories and small businesses. The most important industries are brick and tile-making, ceramics and clay pots.Various farms in the area produce the famous Chianina cattle. Sinalunga is an excellent tourist centre, with numerous historic attractions, unspoilt countryside and an excellent road and rail network which places it at the centre of communications for the whole of Italy.